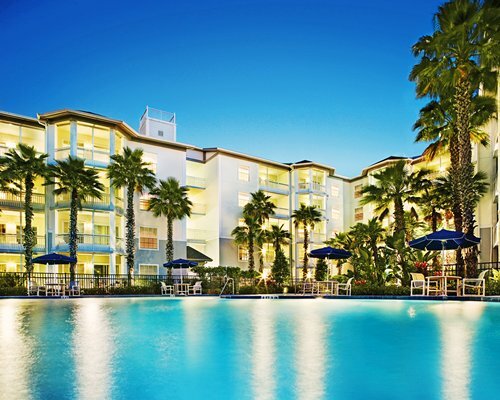 Buy a 7 Night Stay in Wyndham Cypress Palms Near Disney! Wyndham Cypress Palms in Orlando, Florida Near Disney - Buy a 7 Night Stay in a 2 Bedroom Suite! Enjoy 7 Nights in a 2 Bedroom Suite at the Wyndham Cypress Palms in Kissimmee, Florida! Wyndham Orlando at Cypress Palms is located in the heart of all central Florida has to offer. But you don't even need to leave the resort to satisfy every member of the family. The kids will love the two outdoor heated pools, and mom and dad will appreciate the two outdoor hot tubs. Take advantage of the exercise room or get involved in an activities program. Or savor your time together with a family meal at the outdoor barbecue area. Wyndham Cypress Palms is located in the heart of Florida's popular attractions, a short distance from Walt Disney World parks, River Country, Typhoon Lagoon, Water Mania, Arabian Knights, and Medieval Times. Universal Studios, SeaWorld, and Wet 'n Wild are a 20-minute drive away. Old Towne Square and surrounding gift shops are just a few of the places avid shoppers can visit. The Kissimmee area has an abundance of things to do for every member of the family. Your vacation home is air-conditioned and has cable television, telephone with voicemail, stereo with a CD player, VCR, and a Full Kitchen.